It took us a little over four hours of hiking on broken, unstable glacial trail. We saw a few high cirrus clouds overhead, but the weather was great, and surprisingly warm. 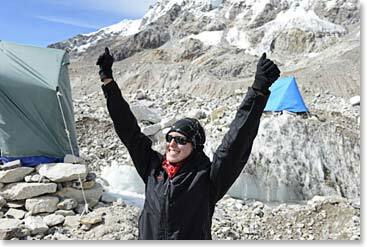 When we reached the lower sections of Everest Base Camp mid-day, we were literally breathless. Visiting this location gave us a new found appreciation and admiration for expedition climbers who come here and stay weeks at a time. Sharon, Jim, and Mingma are down at Pheriche today. Sharon’s eyes were presenting a condition well known to her; she was seeing “floaters.” This had not occurred in more than six years, and even though it was disappointing, we all felt a visit to the doctors in Pheriche was called for. Thankfully, Sharon’s eyes checked out completely normal by the time she returned to the lower elevation at Pheriche. We spoke to her and Jim as they were finishing dinner in our lodge next to the clinic. They are doing great and they will meet us at Ang Temba and Yanzing’s lodge in Pangboche on the 23rd. 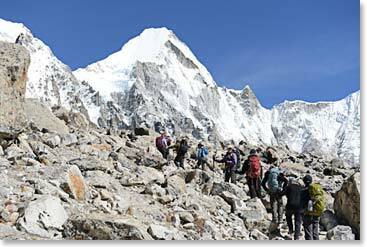 We negotiated rough glacial terrain all the way into Base Camp. 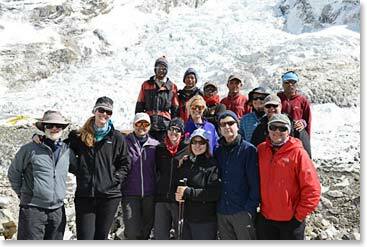 The Team at Everest Base Camp!